Published on February 21, 2018 in Daily Dirt, Equipment & Products and National. Closed Tags: construction, construction industry, contractors, cordless landscaping tools, Cordless power, cordless tools, DeWALT, DEWALT 20V MAX, DEWALT 40V MAX, infrastructure, landscapers, landscaping, mowers, safety. The 2x20V MAX* Brushless Mower is optimized for use with DEWALT construction battery platforms. 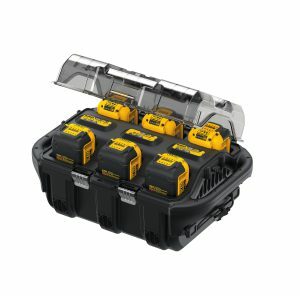 The two DEWALT 20V MAX* 5.0Ah Batteries (DCB205) work simultaneously to deliver the power demanded by the user and provide flexibility to be used with other tools in the DEWALT 20V MAX* system. The 2x20V MAX* Brushless Mower marks the continued expansion of the DEWALT 20V MAX* system of 100+ products and is also compatible with the DEWALT FLEXVOLT® battery system for maximum flexibility and extended runtime. The 40V MAX* Brushless Mower is optimized for use in landscaping applications. Powered by one DEWALT 40V MAX* 6.0Ah Battery (DCB406), the 40V MAX* Brushless Mower marks the continued expansion of the 40V MAX* system of outdoor power equipment from DEWALT. Both the 2x20V MAX* and 40V MAX* Brushless Mowers feature high-efficiency brushless motors to deliver consistent cutting performance. 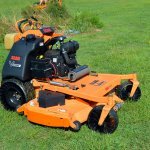 They also both offer a 20” metal deck to cut a large path, a folding handle for upright storage, and front deck and rear deck carrying handles for easy transportation. They can mulch, bag, or rear discharge grass clippings. Additionally, the 2x20V MAX* mower features an on-deck LED light board which signals state-of-charge for each pack and indicates when a recharge is needed. DEWALT continues to develop both its 20V MAX* and 40V MAX* systems of tools to offer solutions for construction and outdoor applications. Available in early 2018, the 2x20V MAX* Brushless Mower will come kitted with two DEWALT 20V MAX* 5.0Ah Lithium Ion Batteries (DCB205) (DCMW220P2). Also available in early 2018, the 40V MAX* Brushless Mower will come kitted with one DEWALT 40V MAX* 6.0Ah Lithium Ion Battery (DCB406) (DCMW290H1), as well as bare (battery and charger sold separately) (DCMW290B). The mowers come with the standard DEWALT 3 year limited warranty, 1-year free service, and 90-day money back guarantee. 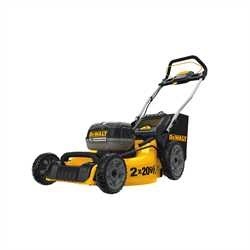 The 2x 20V MAX* DEWALT 3-in-1 Cordless Lawn Mower is powered by (2) 20V MAX* batteries to deliver 2x the voltage. The high-output brushless motor delivers powerful performance and increases torque in high overgrowth. 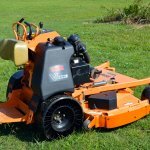 The lawn mower’s 3-in-1 capability allows for mulching, bagging, or rear clipping discharge. It is perfect for properties up to 1/4 acre. For optimal performance, the battery-powered lawn mower can be paired with high capacity 20V MAX* DEWALT batteries or FLEXVOLT® batteries for extended runtime and maximum compatibility across DEWALT battery systems. This cordless lawn mower is designed to help you get the job done with a 20 in. metal deck, quick and easy single lever height adjustment, and folding handles for compact upright storage. Single lever height adjust ranging from 1.5 in. – 3.4 in. Single lever height adjust ranging from 1.5 – 3.4 in. Published on November 17, 2016 in Equipment & Products. Closed Tags: 6-Pack Charging Station, construction, construction industry, contractors, DeWALT, DEWALT 40V MAX, infrastructure, landscaping. DEWALT® continues to expand its 40V MAX* Battery-Powered Outdoor Equipment at the 2016 GIE+EXPO with the new 6-Pack Charging Station (DCB116) and Pole Hedge Trimmers (DCHT895 family). 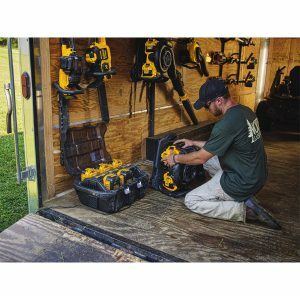 The 6-Pack Charging Station from DEWALT is designed to charge the batteries necessary to power DEWALT outdoor power equipment and to eliminate the need for 2-cycle gas mix on landscaping trucks. Plug in the 6-Pack Charging Station to sequentially charge up to six 40V MAX* batteries at a fast rate. Each DEWALT 7.5Ah battery charges in under an hour, and each 6.0Ah battery in 45 minutes. Once one battery is charged, the charger will automatically switch to the next battery, choosing the battery closest to full charge. Each battery compartment includes indicators showing charging status: fully charged, charge in process, or waiting to be charged. 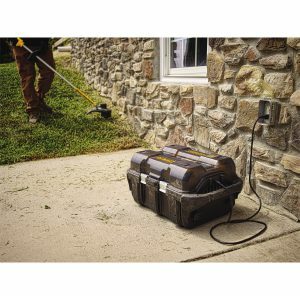 The 6-Pack Charging Station is also water resistant and includes a cover to help protect the batteries from outdoor elements and landscaping debris. 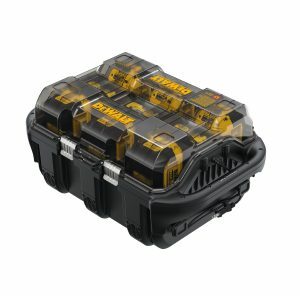 In addition, the 6-Pack Charging Station provides an organized storage solution for DEWALT 40V MAX* batteries and is optimized for transport with carrying handles. The Pole Hedge Trimmer is designed to cut through a variety of landscape overgrowth including medium and tall hedges as well as large bushes. With a cut-rate equivalent to that of competitive gas-powered units, the 22” dual-reciprocating, laser cut blades offer sharp shearing with a cut capacity of up to 1” thick branches. The Pole Hedge Trimmer features a telescoping shaft for trimming in compact spaces when retracted, as well as in many hard-to-reach areas when fully extended. An articulating head allows the user to maneuver the Pole Hedge Trimmer to a variety of angles, cutting in 8 different positions, adjusted by 15° increments. This Pole Hedge Trimmer provides a runtime of over 3 hours when paired with a 7.5Ah 40V MAX* battery pack (DCHT895X1). Equipped with the brushless motor and removable gear case cover, the Pole Hedge Trimmer allows for easy serviceability and eliminating gas-related maintenance issues. The 6-Pack Charging Station will be available in early 2017. The Pole Hedge Trimmer , also available in early 2017 will be offered as a stand alone unit or kitted with one 4.0Ah battery or kitted with one 7.5Ah. 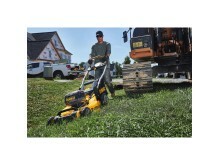 The DEWALT 40V MAX* Outdoor Power Equipment provides the power, runtime and durability the professional landscaper demands with GAS PERFORMANCE. GUARANTEED™. The DEWALT battery-operated equipment improves workplace efficiency by eliminating trips to the pump, fuel mixing, constant pull starts, minimizes maintenance and provides low noise levels for properties with noise restrictions and cities with bans on noise levels or gas-powered equipment. DEWALT Outdoor Power Equipment comes standard with a commercial three-year limited warranty, one-year free service contract, and 90-day money-back satisfaction guarantee. Getting into a battery-powered system has never been easier; premium 40V MAX* 6Ah and 7.5Ah batteries come with an extended 2-year free service contract, eliminating many of the maintenance and gas costs including gas, oil, and stabilizer costs associated with operating gas-powered products. For more information, visit www.dewalt.com or follow DEWALT on Facebook and Twitter. Published on October 28, 2014 in Daily Dirt and Equipment & Products. Closed Tags: construction, construction industry, contractors, John Deere, landscaping, MICHELIN, Michelin Tweel Technologies, mowers, Tweel. 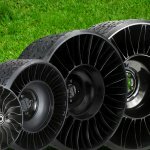 At this year’s Green Industry and Equipment Expo (GIE), MICHELIN Tweel Technologies announced it has partnered with John Deere to equip its ZTRAK™ 900 Series line-up of zero-turn commercial mowers with the ground-breaking MICHELIN® X® TWEEL® TURF™ as original equipment to replace a standard 24x12x12 tire. Available on the 54-, 60- and 72-inch deck sizes, the MICHELIN X TWEEL TURF eliminates downtime and is maintenance free. 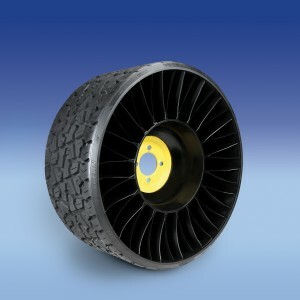 The newest version of this award-winning technology, MICHELIN X TWEEL TURF airless radial tire is available for landscape professionals who normally experience expensive and inconvenient downtime associated with flat tires. 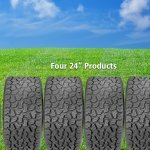 Using automotive rubber technology, the tread lasts up to three times longer than standard turf tires. Operators will experience greater performance than with a pneumatic tire, increased uptime, enhanced hillside stability, reduced operator fatigue, and improved productivity resulting in a lower cost of ownership. 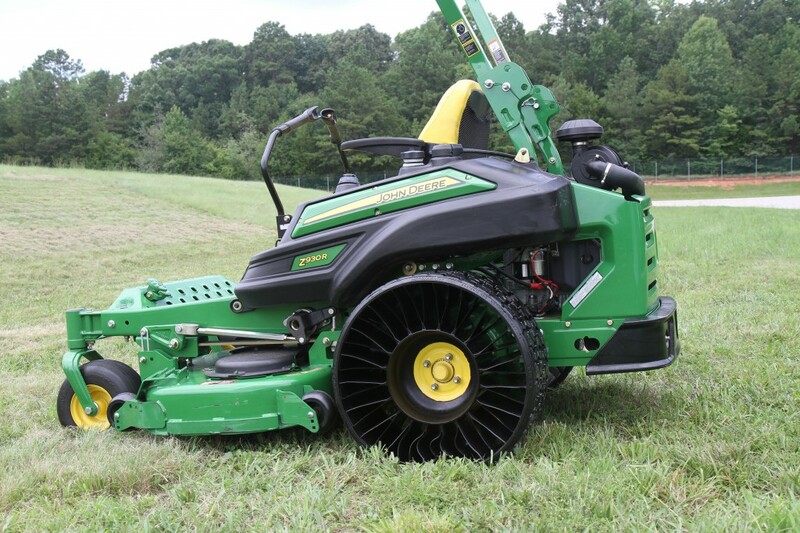 The new MICHELIN X TWEEL TURF offers high strength, poly-resin spokes to carry the load and absorb impacts while providing reduced machine bounce. This translates into excellent operator comfort and in turn, productivity. The proprietary design also resists damage. The multidirectional tread pattern is optimized for hillside stability and helps prevents turf damage. The proprietary Comp10 Cable™ technology allows the load to hang from the top, resulting in low contact pressure that mimics air filled tires. 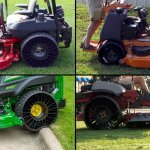 The MICHELIN X TWEEL TURF is the only 24x12N12 commercial product available to offer the advantages of no maintenance, no compromise and no downtime. The four bolt pattern, heavy steel gauge steel hub fits a variety of popular zero-turn commercial mowers.